WE DID IT, BUT NOT WITHOUT THE HELP OF 82 OF YOU! See the last post for a detailed list of all who contributed to the project . Keith from Watershed Construction & Restoration generously sent two of his team over this week to put the metal on the roof, the final step of the project. Thanks so much Keith, Dave and Matt for getting it done! The cooler has been running for almost two months, with thousands of pounds of food going in and out of it. All that donated produce was then sent to those in our community with limited access to healthy, fresh local food. None of this would have been possible without all your help and most importantly all the time and expertise Neil Husher from Vermont Architects Collaborative put in to the project over the spring and summer. He gave many, many hours of his time to making sure each step of the project got us closer to our end goal -- having this great new resource to serve the community. 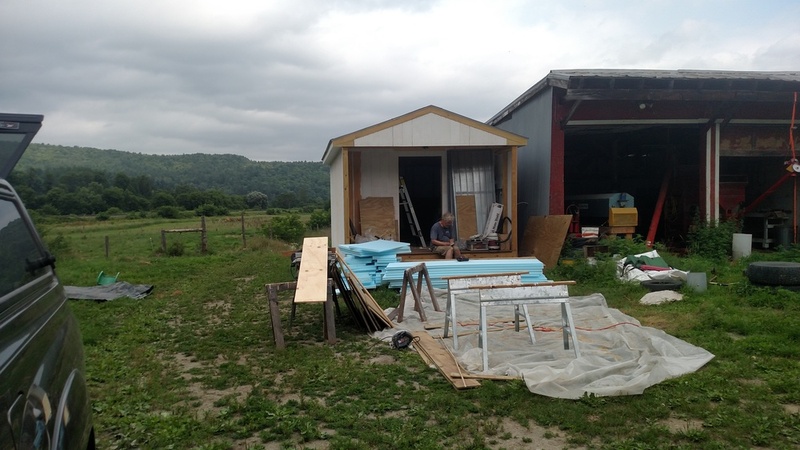 We also want to thank Nate Rogers of Rogers Farmstead again for opening up his farm to us and to all the volunteers as we worked to build the cooler. Thanks for giving the cooler a home and being super flexible as we took over some of his space to build the cooler. This season we have recovered over 17,000 pound to date and more food goes into the cooler daily. Since CHCV was founded in 2014 a total of over 70,000 pounds of food has been recovered and donated. Thanks to the 82 businesses, professionals, and individuals that helped to build our new cooler! 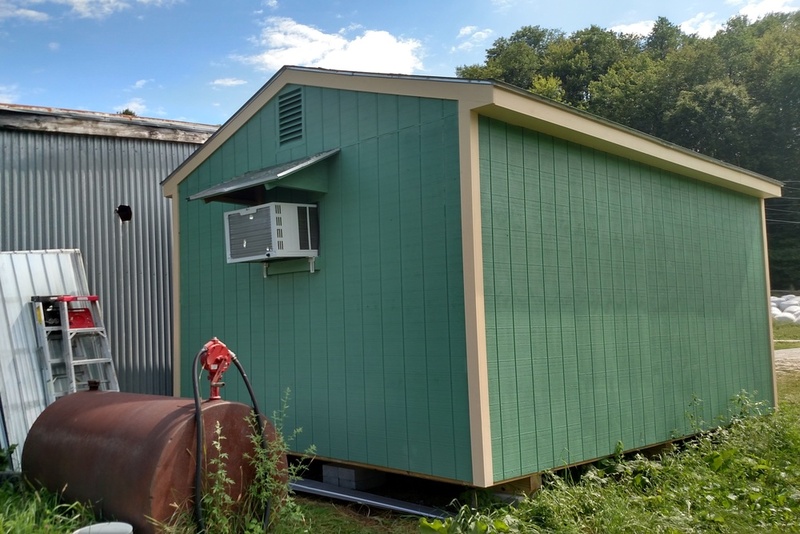 A super special thanks goes out to Neil Husher and Vermont Architects Collaborative who worked closely with CHCV and donated many many hours to design and lead all the volunteers listed below in building the cooler over the last four month of planning and building. Last, but not least a very special thanks goes out to Rogers Farmstead for generously hosting our cooler building at their farm in Berlin. Come visit their farm stand for yogurt, raw milk, flour and more. All painted and looking good! Hoping the roof fairy will come over the weekend, if not we will need a team with some roofing skills. Another great team getting the last of the painting done. Sitting down on the job, can still get the work done in this case. Cooler is up and running, coolbit and AC working well keeping it 36 to 38 degrees even on the hottest days. One of the first loads going in with help form CCV Service Learning volunteers. Thanks to the 78 businesses, professionals, and individuals that have helped so far to build our new cooler! 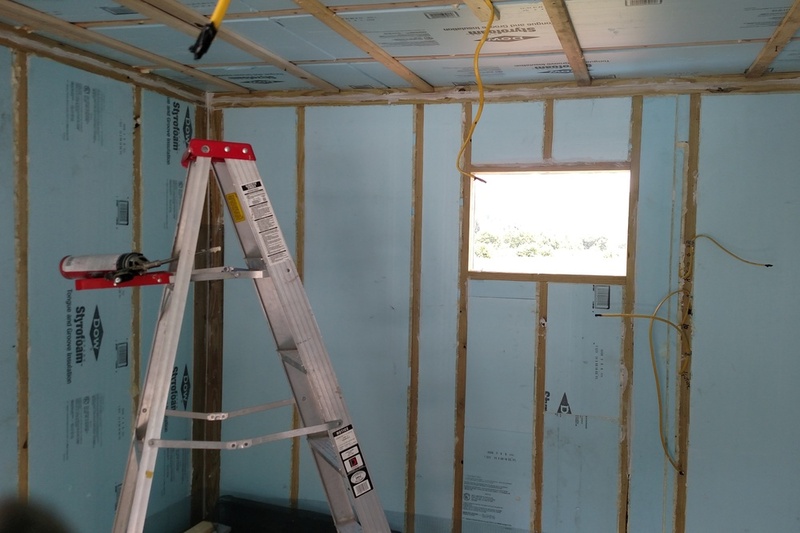 Finishing up the insulation and getting the PT plywood on the walls and ceiling. Sunday work day- another great team getting lots done. The very last piece of blue board insulation cut to go in!!! Neil having fun with FRP - that was only the third piece of 20. Others were a little less fun. More painting - FRP on the ceiling is FUN (not) - the last of the ceiling FRP finally in. And looking good, all 8 layers of the walls are done! We have another workday scheduled for Sunday July 24th to get the AC and door in and finish trim and painting. Maybe a bit of roofing too. Come join us! Thanks to the 73 businesses, professionals, and individuals that have helped so far to build our new cooler! A very special thanks goes out to Rogers Farmstead for generously hosting our cooler building at their farm in Berlin. We are still at it and almost there! Getting the insulation and hardware cloth in and sealing, sealing sealing! CHCV's new UVM Intern Holly St. Jean, helps with cooler building on her first day. We look forward to having her help in all aspects of the program over the summer and maybe in to the fall. We have now been working for over a month on the project. Priming almost done with extra help on our 11th work day. New and returning volunteers came to help. Thanks Lisa Mase for sharing your UVM Intern Meg with us! Next up a painting party anyone? Another great team...Neil going a bit screwy - The AC unit will get quite a nice pastoral view - The rain sets in after a hot day of work. Come join us next week to try and get it finished off! Thanks to all the businesses, professionals, and individuals that are helping to CHCV build our new cooler! Almost There, But Not Done Yet! Roof three quarts on, wires in for electrics, more than half of the insulation and priming done - all dry inside and starting to be cool! Thanks to the 66 individuals, businesses and organizations that have made this project possible. Lets get it finished so we can start putting food in it! A hot sunny day, nice and dry for roofing, just a little warm. Another great team, getting lots more done. We have made so much progress since we started construction on June 4th. Now we need to push through to the end to get the rest of it finished. June 30th and July 1 are the next work days - hope you can join us! The Newark Academy joined us in the afternoon to get many smaller projects done fast. Thanks to another great team for all their help getting lots done! We are working hard to finish so the produce that we are already starting to glean has a place to stay cool. 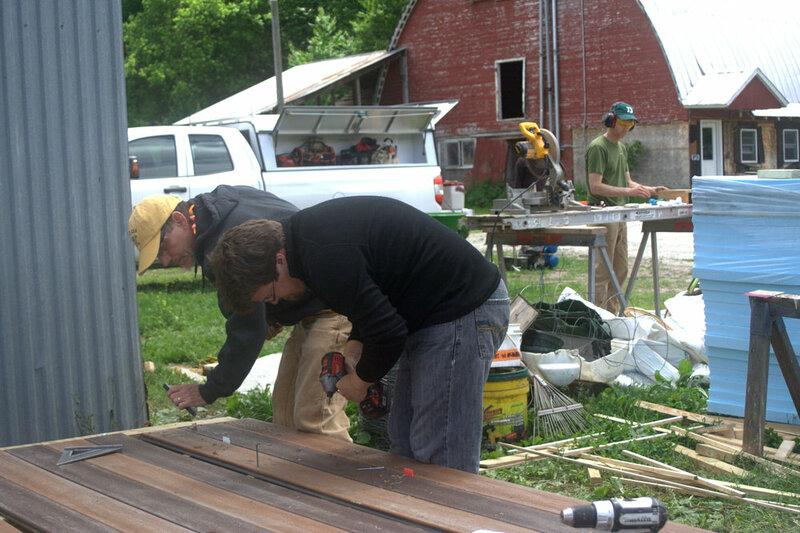 Come be part of the team for the next work day - this week June 23, and 24th . There are jobs for all skill levels. This Project Would Not be Possible Without Help from all of You! Thanks to all the businesses, professionals, and individuals that are helping to make it happen! A special thanks goes out to Nate Rogers from Rogers Farmstead for generously hosting our cooler building at their farm in Berlin. Lots of rafters that went up fast, with Theo, Allie, Katura, Neil and Eli helping! Now we can put a tarp on and keep the rain out until next workday next week on Wednesday the 22nd. Another productive workday - thanks to the volunteers who stepped up and came to help when we needed more hands. 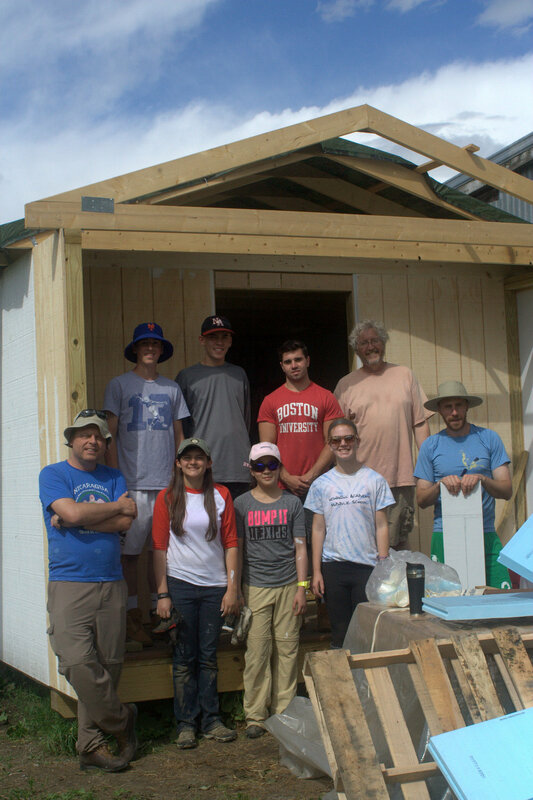 We have a building (w/a tarp for a roof and roofing as a wall)! We have more workdays planned for next week on Wednesday the 22nd, Thursday the 23 (AM only) and Friday. We can use more help so let us know if you can come out. 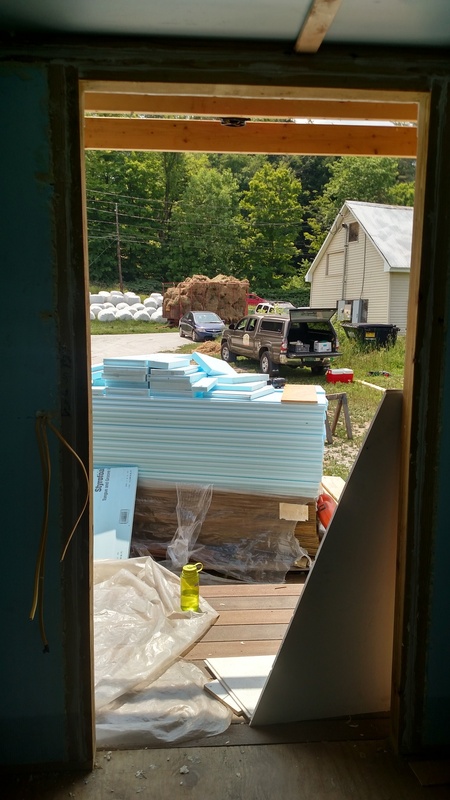 Fourth Workday - Walls and Siding! The Saturday morning team, David, Caleb, Neil, Hannah, Tammy, Gracie, Maribeth and Duane. Walls and siding - priming, stapling, - hammering - lots for all to do. A bit damp, but got a lot more done. Hoping to get the roof on this next week. Wednesday June 15th is the next workday. Please come help! The Walls Start to Go Up! Thanks to Allen Lumber for the striped decking and other discounted materials for this project. Lots of hard work by volunteer builders calls for a good lunch provided by CHCV with help from the Hunger Mountain Coop, Four Springs Farm and Manghis Bread. Thanks to another great volunteer team. Its starting to really grow and become something. We are looking forward to another great building day tomorrow - Saturday June 11. Come join us or for one of the workdays over the next few weeks. Wednesday June 15th and maybe June 22, 24 and/or 26th. Let us know when you want to come help! Lots More People Helping and Donating to the Project! Community Harvest of Central Vermont's new cooler is becoming a reality. Thanks to all the businesses, professionals, and individuals that are helping to make it happen! Second Day - Floor All Insulated! The morning team working hard to get the floor ready to be lowered. Ashton, Mark, Emily and Neil. A team of strong crossfiters from Green Mountain Crossfit joined us and others to easily and safely lower the floor into place. A great big thanks to the crossfit team for showing up to do the heavy lifting! Northfield Senior Center's chef Pete Clark, also stopped in to help. As one of CHCV's recipient partners he is looking forward to benefiting from the new cooler. Lowering the floor and making final adjustments to level it. Many strong hands make it look easy! Getting ready for insulation! After the floor joists are in place - shims, plywood, caulk, lots of insulation, spray foam, more insulation and finely plywood on top for the floor. Another productive day! 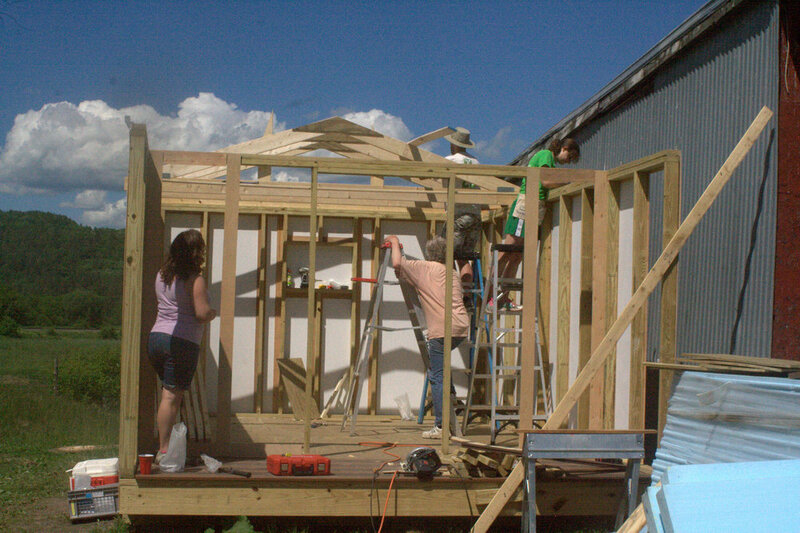 Tomorrow and Saturday - June 10 & 11 - Walls and then roof! Come join us. Siding to prime and paint, projects for all! Blocks laid in preparation for building at Rogers Farmstead, the farm that will host the CHCV cooler building. The team at work - looking over plans, cutting lumber and insulation, and framing the floor. Hot and happy after a long day of hard work! Thanks to All Who are Helping! Thanks to all the businesses, professionals, and individuals that are helping to make Community Harvest of Central Vermont's new cooler a reality. A special thanks goes out to Rogers Farmstead for generously hosting our cooler building at their farm in Berlin.